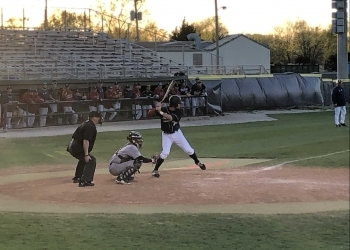 News broke on social media Wednesday evening that Oklahoma Wesleyan’s star shortstop Austin Sojka was named to the mid-season watch list for the Golden Spikes Award, which is given to the best amateur baseball player in the country by USA Baseball. Previous winners of the award include Bryce Harper, Buster Posey and Robin Ventura. Sojka has set the world on fire with his offensive numbers this season. Sojka’s .489 batting average ranks second in the nation, 60 runs scored is also second most in the NAIA and his 13 home runs rank ninth. The senior from Huntington Beach, California says the honor is very humbling. Sojka has been a major part of the Eagles offensive success. OKWU is also near the top of the leaderboard in several other offensive categories. Sojka says that is thanks to friendly competition between everyone in the lineup. The star shortstop says it’s an honor to be on a list of top amateur players, most of which are projected to be selected early in June’s Major League Baseball draft. Despite its reputation as an NAIA baseball powerhouse, Oklahoma Wesleyan has never had a player selected in the MLB Draft or play in the minor leagues. Sojka says professional baseball is something he could see in his future, which hasn’t always been the case. Sojka went 1-5 with an RBI in Thursday night’s 12-4 victory over Avila University.